As humans, we’re intimately tied to the skull—it’s not only a part of us, but it represents something much greater than ourselves. The ultimate symbol of death; a stark reminder of our own mortality. Throughout history, artists and writers have meditated on this passing with the skull as the introductory point. Shakespeare’s Hamlet famously does so, using the sighting of Yorick’s (the jester) skull as a trigger for memory and contemplation. Hamlet remembers the man’s “excellent fancy,” but can’t reconcile between the Yorick of then and the Yorick of now. His dilemma is not unique. At some point or another, we will all confront the confusion the character feels. Some prefer to confront our mortality head on (pun intended) and express our fleeting existence—in the grand scheme of the universe—through pictures. 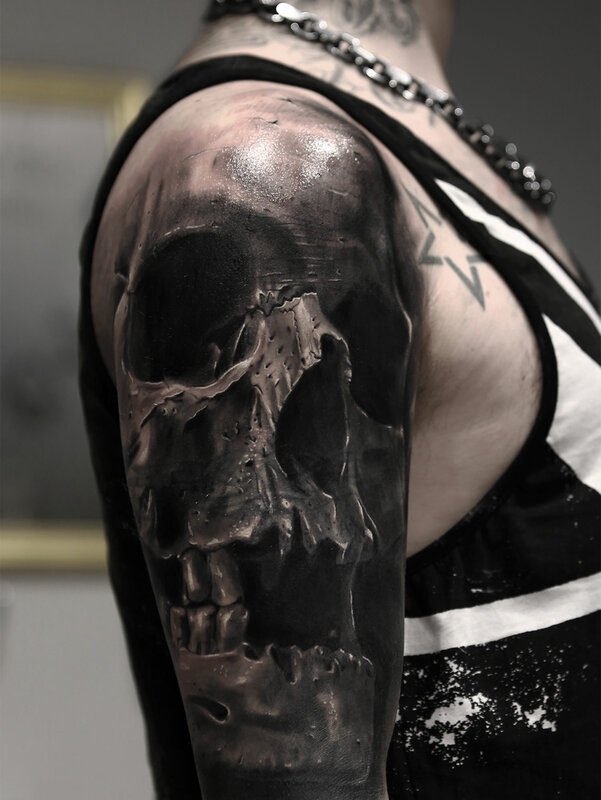 Skulls have been the subjects of paintings throughout art history and continue to play a role in contemporary works. 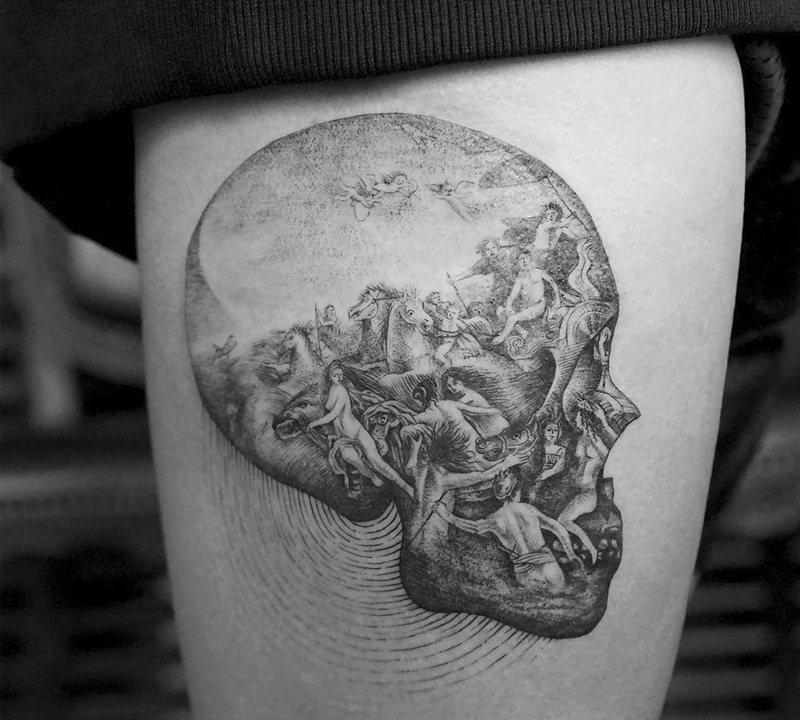 This includes in tattoos, which have another level of morbid meaning—the skulls on skin will outlast the mind of the wearer. Despite this fact, they continue to be a popular subject, and one that has a lot stylistic possibilities. Above: Mr. K’s tattoo is reminiscent of Peter Paul Rubens’ “The Battle of the Amazons” (1600). 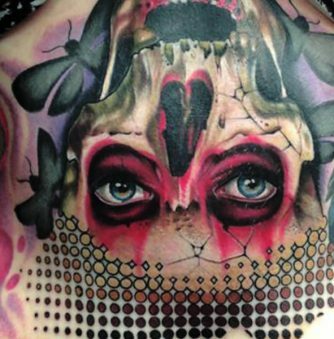 This tattoo was created as a flash piece by Chris Rigoni, and a client later gave it a home on his skin. 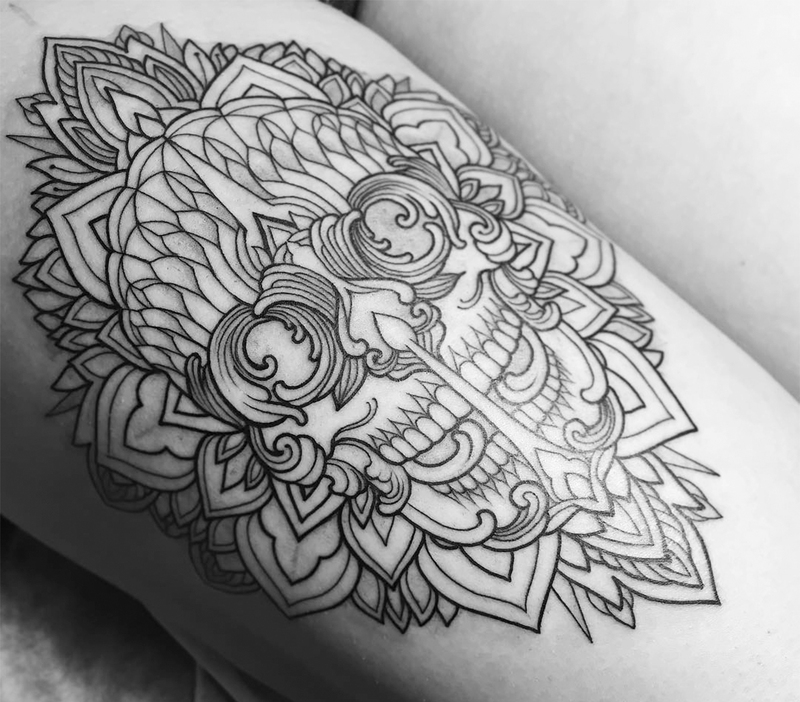 Chris Rigoni recently made the decision to narrow his focus—work less, but ink designs that he feels truly passionate about. The resulting images are a mixture of influences, combining realism with bold, stylized lines and a myriad of inspirations. “I nerd out pretty hard on space, the universe, quantum physics, astrophysics…” he told Kobini. 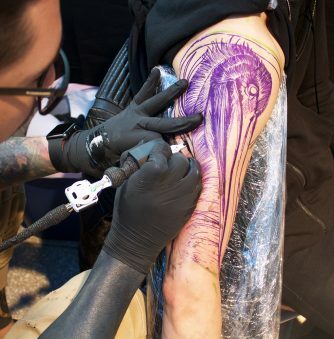 “If I could have become anything, I would’ve become an astronaut.” These diverse interests mix with traditional tattoo subjects (like skulls) to bring a fresh, individualized spin that looks towards the future while not forgetting the past. 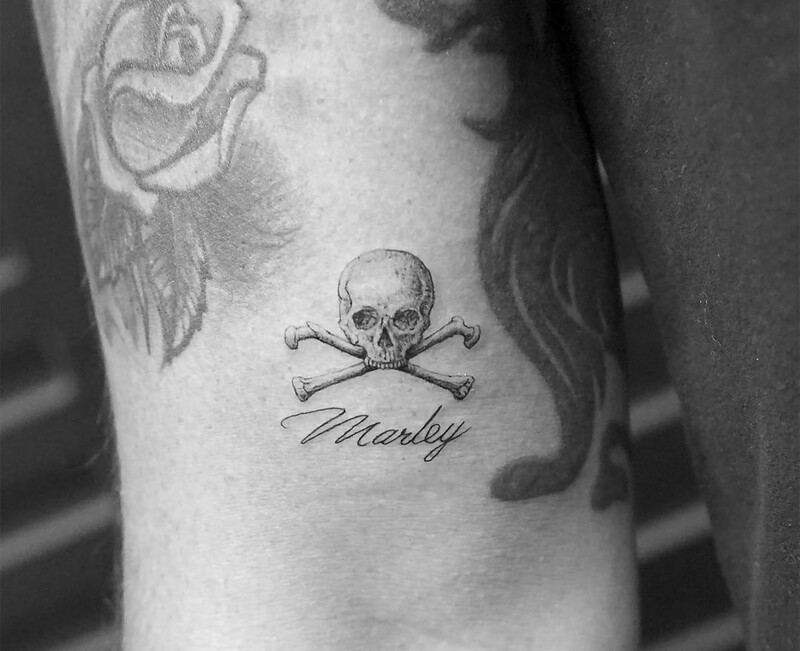 The skull and crossbones imagery originated in the Late Middle Ages. Mr. K is comfortable working both large and small for his delicate, highly-detailed works. 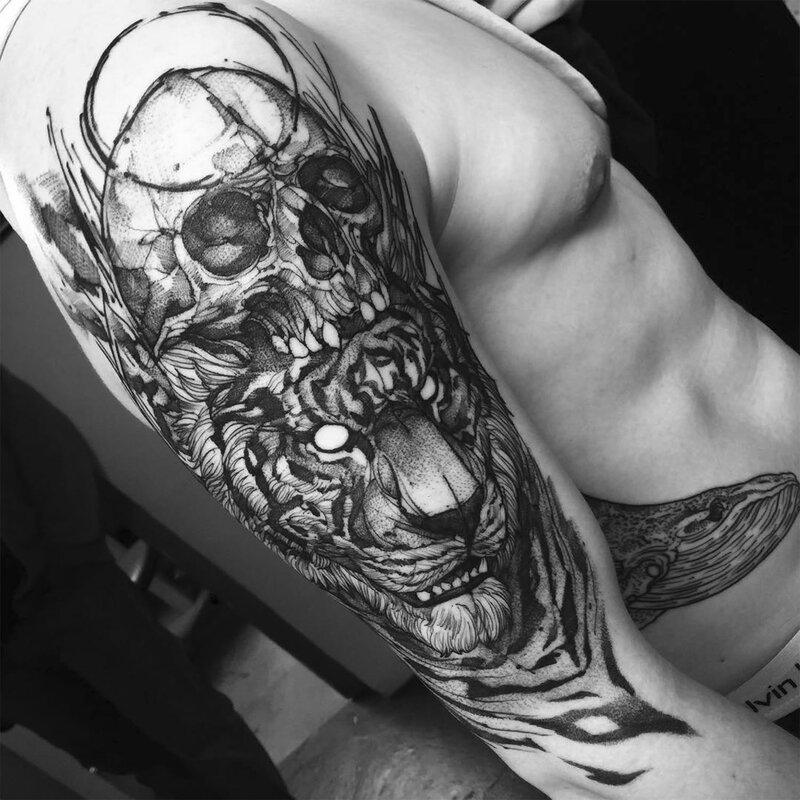 Inspired by artists of centuries past, one of his skull tattoos (at the very top) reference scenes of war, like “The Battle of the Amazons” a 17th century painting by Peter Paul Rubens. The characters fall over one another, working towards a mutual demise. Contained within the shape of a human skull, we can guess what comes next for the people in this conflict. The dramatic shadows and glints of light make Silvano Fiato’s highlight the physicality and emotion of each subject. 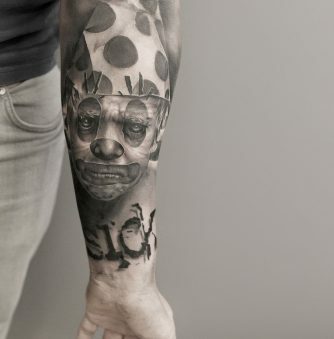 Inspired by chiaroscuro painter Caravaggio, Silvano Fiato infuses drama into his hyperrealistic body art. 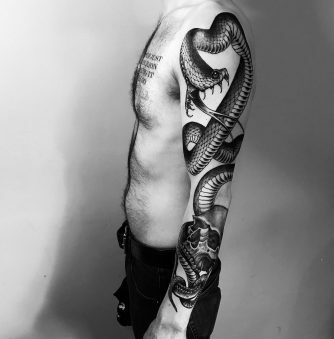 He’s always been interested in drawing and painting, but became enamored with tattoos at age 18 after seeing realistic pieces by Robert Hernandez. 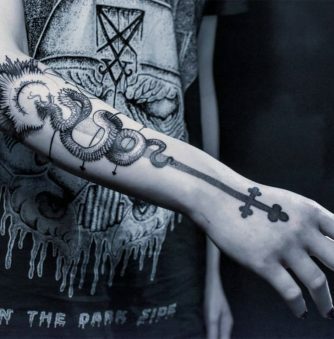 “I finally realized that what I had always done on paper, it was possible to do on skin,” he told us in an interview. 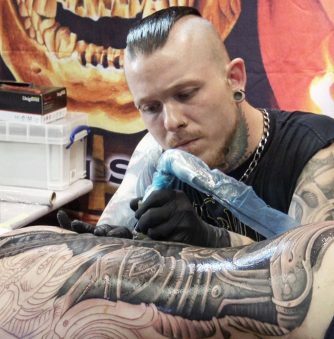 Since then, he has put all his effort into creating awe-inspiring work, opening up his own studio called Eternal Tattoo Studio over 10 years ago. AD Pancho is adept at portraiture and also creates faithful reproductions of popular figures in pop culture. 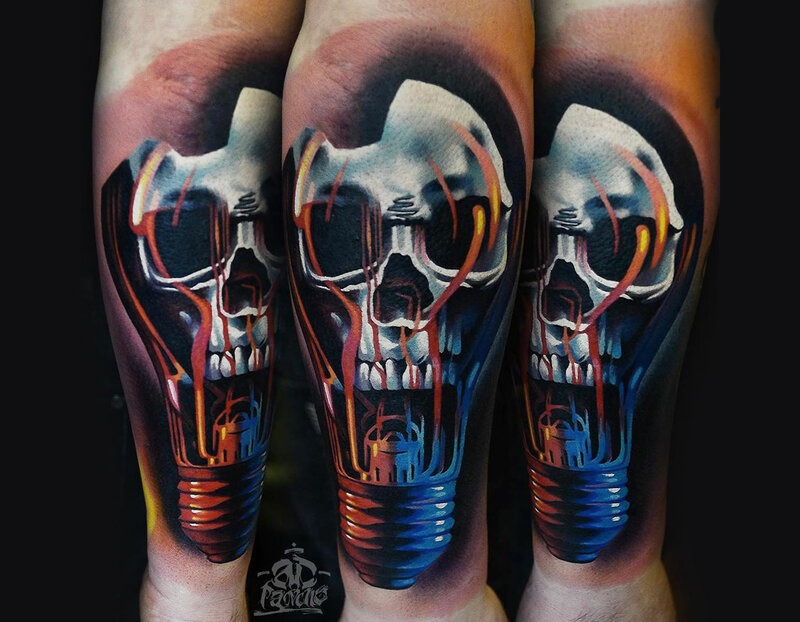 Artist AD Pancho specializes in color realism and creates incredible three-dimensional-looking pieces by blending deep hues. Known for skull tattoos and pop culture portraits, the designs retain their vibrancy—when comparing one of his freshly-inked design with a piece he did a year ago, the colors are equally as brilliant. The skull’s darkened eyes stand in stark contrast to the whites of the tiger’s eyes. 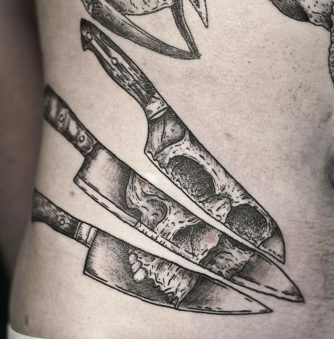 Like AD Pancho, Fredão Oliveira often incorporates skull imagery into his tattoos. The bold, commanding lines showcase a sketchbook-like approach as they depict the death of man as it adorns the head of a tiger. Oliveira provides little insight to this abstracted, harrowing scene, but one thing seems clear: in the battle of man versus beast, the beast comes out on top. 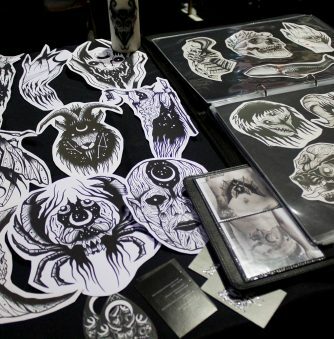 Sasha Masiuk also creates temporary tattoo designs through Tattoo You. 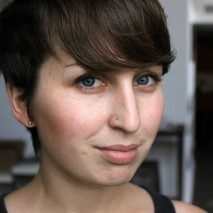 Death means something different to everyone, and here, Sasha Masiuk has combined it with the mandala. The literal meaning of this Sanskrit word is circle, which has significance if you view the skull as a symbol of death—everything is cyclical, so the two go hand-in-hand. Masiuk enjoys tattooing plants “and lots of skulls,” which make this tattoo (seen here in its first session) a culmination of all her interests. The framing of the skull and its solid black background create the illusion that it’s emerging from the shadows. 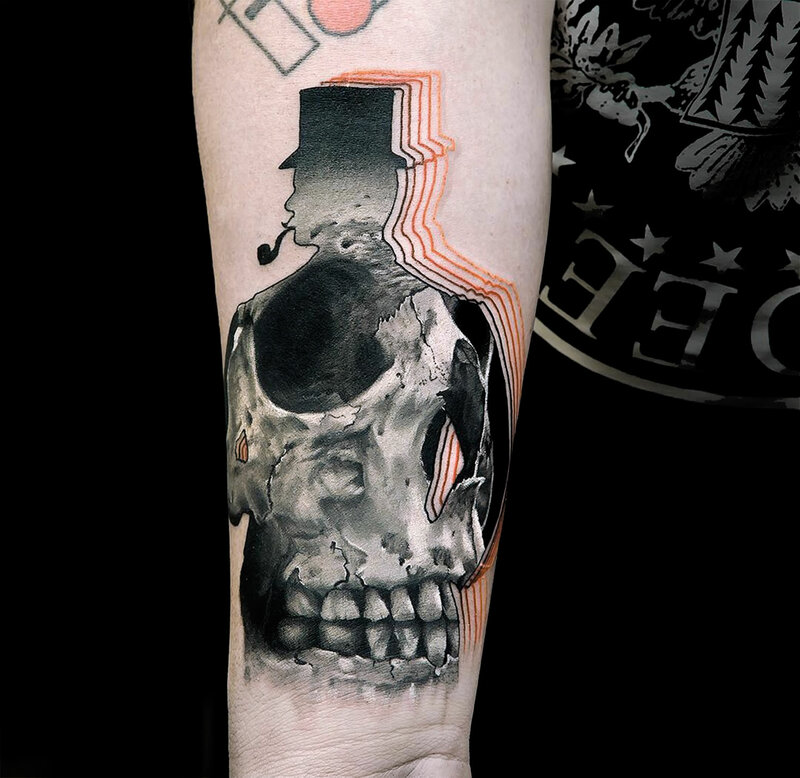 This bold and haunting tattoo by Placide Avantia is a collaboration between herself and the band This Quiet Army. 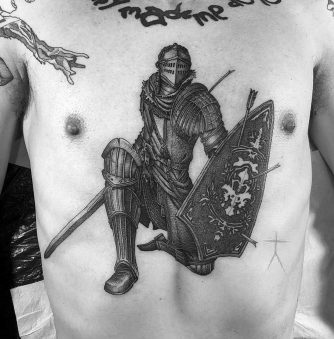 The image was originally designed for a t-shirt, but its shape fits perfectly over the chest of a client “who stood like a rock” according to Avantia. 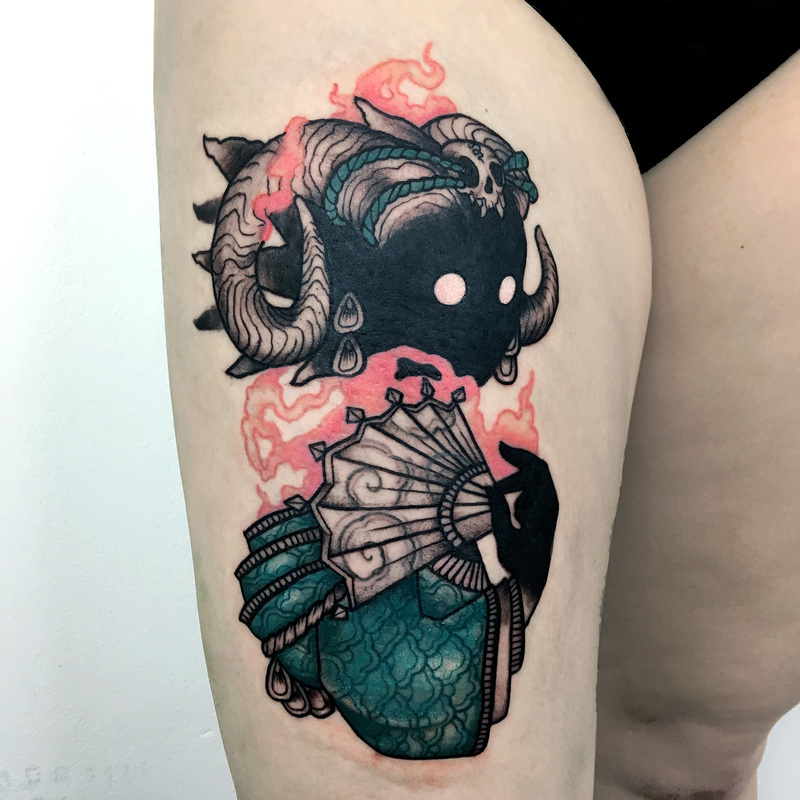 The sprawling piece represents a departure for Avantia, whose other designs tend to be much smaller in scale—although if this tattoo is any indication, she should work larger more often. 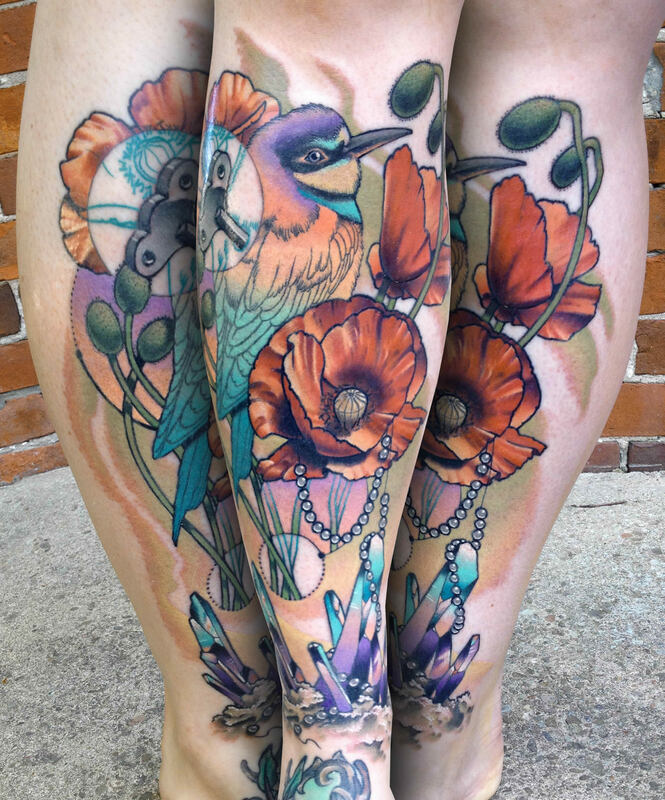 Led Coult’s bountiful tattoos breathe life into something commonly associated with death. 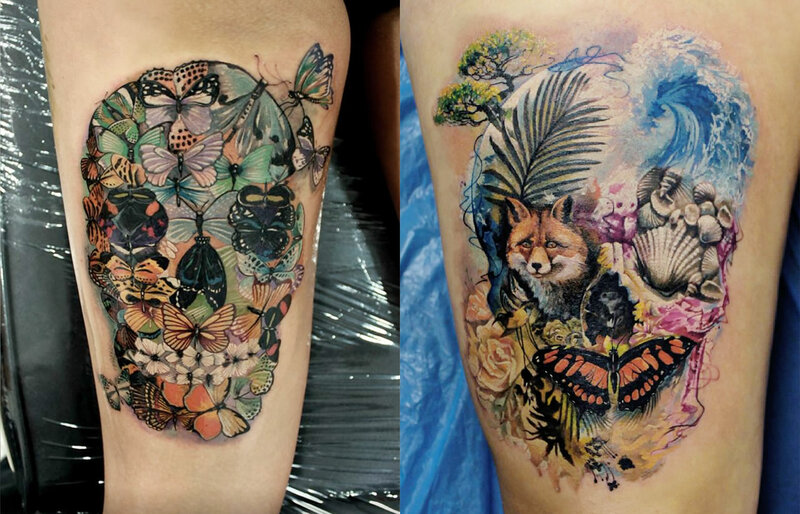 Although many skull tattoos are somber in tone, Led Coult takes a seemingly opposite approach and fills the iconic shape with vibrant nature and wildlife. The concept of these two pieces are reminiscent of Italian painter Giuseppe Arcimboldo who is known for creating portraits where fruits, veggies, and other objects that make up the head of his subjects. Contemporary artist Zachari Logan also touches on this idea in his work, which has the overarching theme of human connectedness to nature. 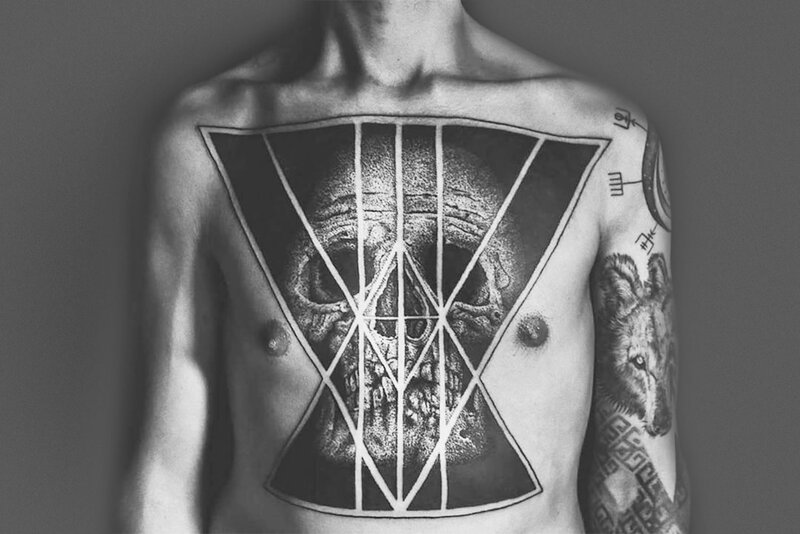 Max Amos experiments with many types of tattoo approaches but keeps nearly all his designs as blackwork. 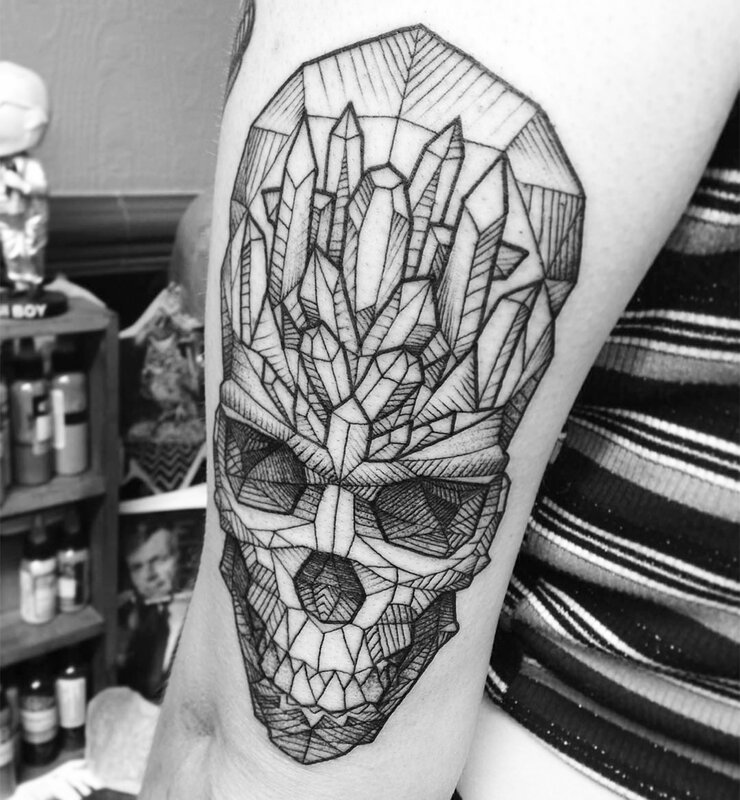 Artist Damien Hirst encrusted a skull with diamonds, and Max Amos created a tattoo equivalent with crystals. Although diamonds symbolize wealth (an obscene amount of it went on Hirst’s piece), crystals like these have a different meaning. Amos’ depictions are often lauded for their spiritual benefits—something that theoretically, his design is rich in. This geometric focus is just one of the ways in which Amos works. 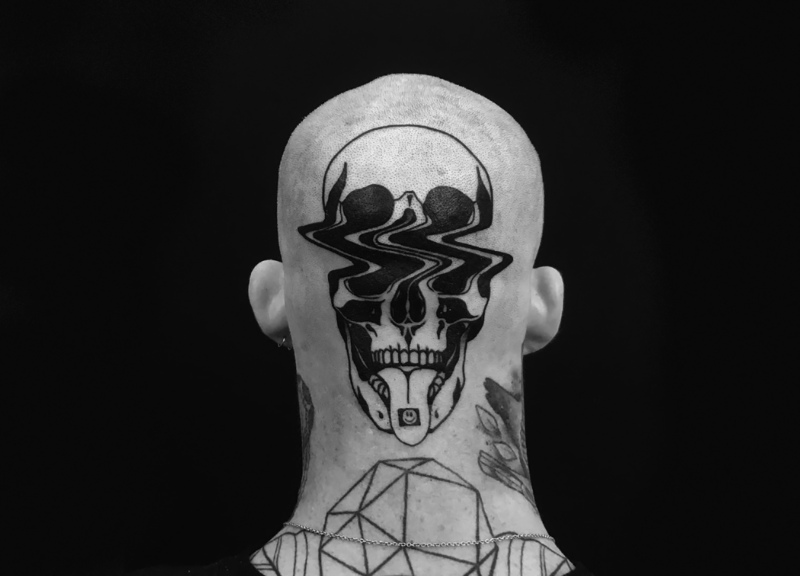 Elements of realism and dotwork are part of his tattooing portfolio, as is another brilliantly simple skull created in the halftone effect. 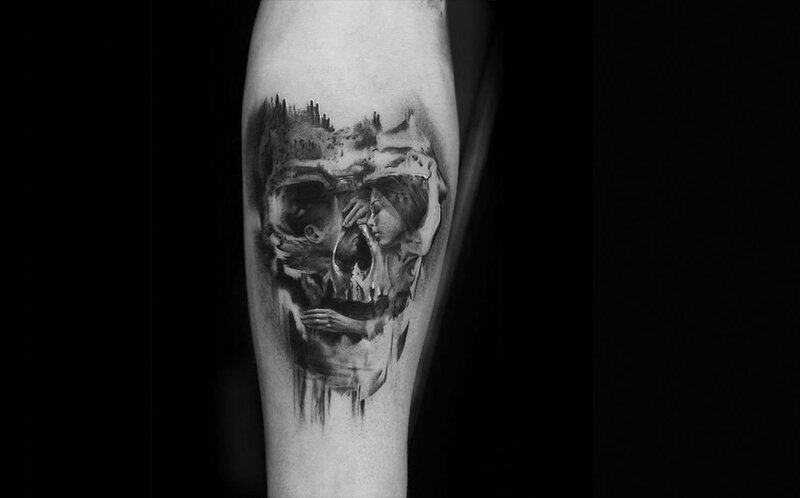 Niki Norberg’s tattoo shows similarities to the work of Tom French (“Vanitas” painting series). Niki Norberg takes a cue from 19th and 20th-century illustrator Charles Allan Gilbert whose work “All is Vanity” (1892) fused a woman with a skull, creating a double image about preoccupation with beauty. Norberg’s tattoo, however, seems less about vanity and more about relationships and longing, as the female character lays a gentle hand on her partner. Despite the serenity, the dramatic piece is in the midst of decay.